"Marc Übel, based in Cologne, has been releasing experimental electronic music under the alias “Gora Sou” since 2013. In doing so he creates contrasts at all levels; analog and digital technologies are connected with each other, seemingly chaotic arrangements dissolve into clearly ordered structures and apparently contradictory sounds are brought together in compositions that continually develop. 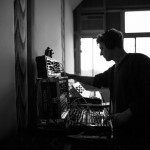 Übel's live sets connect many ideas that are found in his albums – improvisation, a focus on sound textures and the special power of controlled chance. Multiple albums by Gora Sou have been released on labels such as Orange Milk Records, Noumenal Loom, Lillerne Tapes, SicSic Tapes and Further Records."